shoptroll's Google spreadsheet of who's playing on iOS and what sets they have. What are you all playing the new expansion with? Just the base set? I'm not sure I would mix War of Shadows with another set. Or if I did I would mix it with one other set at most. I feel like this set would suffer greatly from diluting the card pool given how the night/day mechanic works. Thanks for the breakdown, shop! Now I have an ordered shopping list. Is it necessary to get Return of the Fallen to understand fates, or does that get pretty well explained in other sets? It's part of the keyword template. It's just an effect that fires when the card enters the center row. Easy peasy. I forgot one other thing that Return of the Fallen added (and is in every expansion afterward): Trophy Monsters. This is explained in the rules for those sets, but it's also pretty simple. You put Trophy Monsters into play like a construct when they're defeated. You can later discard them for a small boost, although some of them have ongoing effects instead. Also if you want to look at any of the rulebooks up to War of Shadows you can find them here. I believe the expansions do tend to go on sale for $0.99 apiece from time to time, although I've not sure since I've bought each at release for full price. Yup. Within a minute of discovering a new one is available. I just got introduced to this game via the physical version this weekend. I guess this is life now. I've played both the app and the physical version. I greatly prefer the physical version. I've played the digital version so much at this point that it actually feels bizarre on the rare occasions that I get out the physical version (of which I only own the base set). The experience of handling something physical that I've seen so much on the screen feels like it's a computer game "come to life." I think the physical version we played was an expansion - I have no idea which one because the art on the app is all sorts of different - as are the cards. I'm still wrapping my head around it, so the app feels like a good trainer. I'm not usually much of a deck builder type but for some reason this one doesn't want to be denied. Harpo, sent you a friend request, assuming your username is / will be "TheHarpoMarxist"! I haven't made an online account just yet - jumping on that now! EDIT - I'm in! Haven't seen the request yet, but my account did indeed exist and carry over from Waterdeep. After an obligatory five minute period of not remembering my password, I got in. TheHarpoMarxist if anyone wants to pummel me while I'm still learning the mechanics. EDIT #2 - Everyone from Waterdeep is here automatically! Weee! Everyone from Waterdeep is here automatically! Weee! I was going to say... how have you not played this yet given how much you played Waterdeep. Is that using expansions? I adore the app version; I find the physical very finnicky by comparison, especially with some of the expansions. Just the base game so far, but I just bought my first expansion, so we'll see. The app is perfectly fine, but I find that for me the game benefits from the tactility of physical cards and counters. I can mentally keep better track of what's in my deck and what's in my discard pile when I can see and feel their sizes changing. The app makes it abstract enough that it's this sort of constant flow of cards without cohesion. I added you as a friend as well--I'm a middle of the road player, so I doubt that I'll pummel you. What expansions are you playing with currently? Currently just working with the base game. I'd expand if things went on sale. Return of the Fallen - This was the first expansion and it kinda shows since it does the typical first expansion thing of plugging some holes in the original release (mechana constructs got a huge boost from this set if I remember correctly). It adds a little more stuff to the base game and the Fate mechanic which is used in pretty much every set going forward. Nothing really bad here but there are better options for a next step now. This is the expansion I ended up getting, actually because you said it patched up the base game. Having played about a dozen or so games with it now, I have to say that I agree: this expansion patches up the base game, but it does so in a really great way. Ascension by itself feels like a game that's largely complete but has a few weird addendums that don't quite go anywhere (Mechana constructs and Lifebound heroes, primarily). It feels unfinished. 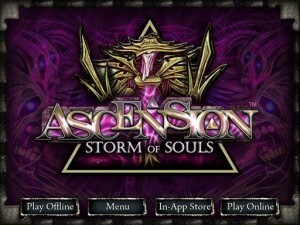 Ascension plus Return of the Fallen feels like a complete and robust game. They pair really nicely. I also got an automatic card shuffler, and it's made setting the center deck up a lot easier. How so? Unless I'm misremembering, his ability is to just acquire a Hero or defeat a Monster without paying its cost. He probably means Adayu the Serene which has a multi-unite ability with all factions. Thanks. That one must be in an expansion I don't have yet. Yeah -- one potential source of confusion is that characters like Adayu and Emri show up repeatedly in different expansions, with different mechanics. Adayu the Serene can lead to some astonishingly silly wins where you acquire every hero and construct left in the deck, then defeat all the monsters four or five times apiece. It can take 3-4 minutes just to watch your opponent's final turn when it happens to you. Doing the accounting with physical cards could take all night. Alternately: it's easier with the physical cards, because after thirty seconds of someone explaining what just happened, you can call it a win and go into the next game. I'm glad you enjoyed it! The first 3 or 4 years of the game there's a tick-tock cycle of big set followed by a little set which generally go together. Return of the Fallen is the little set for the "core" game and builds on the mechanics (even though they're effectively made into core rules for the later expansions). Generally the small sets flesh out the associated big set and make the experience feel more "complete". A few years ago they abandoned the big/little set distinction with the release of Dawn of Champions. Everything released since then is a big set and the main mechanic of each set isn't generally reused in the next set. The exception being Dawn of Champions itself which started as a small set for Realms Unraveled but they put enough stuff into it to make it a full sized set (which also works really well with Realms Unraveled). Harpo, from our recent online matches, I see you are wasting no time getting Ascension figured out! Haha! Thanks - I've been getting some good early draws, and from what I can gather getting that early jump is essential. I'm struck by how important getting cards that banish and cards that give you additional draws are, particularly in the first few rounds. You can survive with one or the other, but if both things happen decks can really get going early. If neither happen you risk drowning in apprentices and getting too many subpar hands. I'm in a fun early game with shoptroll now too where everything on the board costs 6 mana to get or 6 attack to defeat. So we're basically racing to see who gets to break that open first. Thinning your deck is one of the core mechanics in "deck-building" games. Ascension is really nice in that regard since you're always guaranteed to see some cards that do that. The other deck-builder I play, Dominion (also the progenitor of the genre), doesn't always give you that due to how Dominion operates more like a randomized shopping mall of 10 options (with 10 copies each) rather than a randomized conveyor belt. Yup. I don't think I've seen this happen in a while. Later expansions I think are tuned such that the really expensive stuff is less common so it seems to happen less frequently in the more recent sets. We picked up a paper copy of Storm of Souls. It's has some interesting ideas in it, but it feels underdeveloped. It tries to do more with the various factions and encourages you to try to specialize your deck a bit more, and event cards and trophy monsters are core concepts with a lot of potential. 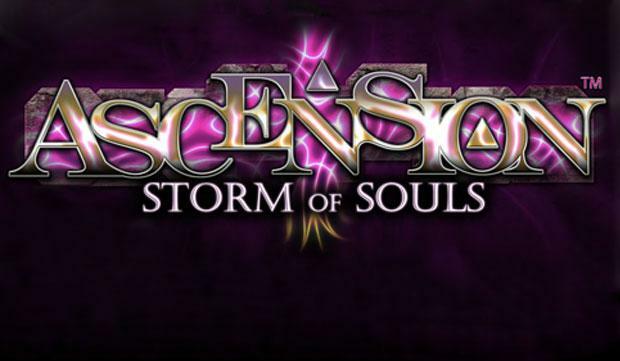 Played on its own, however, Storm of Souls lacks a certain verve to keep each turn interesting. It's disappointing to find yourself late in the game buying Mystics and Heavy Infantry. Cards don't cycle through the center row fast enough to meaningfully focus on a specific faction. Trophies are neat but don't do much more than offer small one-off resource boosts. Events are too swingy: when an Event that matches your deck is in play, you get a boost; otherwise, they're largely ignorable because there's no way to interact with them or manipulate them. Part of this might be a side effect of playing the game with only two players. More than the other two sets we've played, Storm of Souls seems tuned for four players. More players means more cards cycling through which means more opportunities to build cohesive decks. With only two players, you'll end up buying a lot of less helpful cards just to get them out of the center row, and it's a bit too easy to get a logjam of cards that are just a bit too expensive or too powerful to clear out. We're going to try mixing Chronicle of the Godslayer in to see how that changes the balance. Hopefully some of the cards that let you manipulate the center row liven things up a bit. We picked up a paper copy of Storm of Souls. It's has some interesting ideas in it, but it feels underdeveloped. This is why I advocate usually for playing the sets as a block when you can. Immortal Heroes should flesh it out a little more much like Rise of the Fallen does to Chronicle of the Godslayer. And you can play Immortal Heroes standalone as a 2P only game with since it comes with a smaller card pool. With only two players, you'll end up buying a lot of less helpful cards just to get them out of the center row, and it's a bit too easy to get a logjam of cards that are just a bit too expensive or too powerful to clear out. As I wrote above this starts to become less an issue with the more recent sets where there's a little bit of powercreep going on with the center cards so it's easier to buy the expensive stuff that's less prevalent. Are you saying power creep is a good thing in this case?